Parents only want the best of everything for their kids. When it comes to nutrition, clothing, and shelter, nothing should be substandard or just okay. Even when it comes to playtime, parents want to provide the best toys, the best playsets and the best swing sets that they can afford. However, one of the challenges that parents have is that our world today is filled with the products of technology. Almost everyone has electronic gadgets for entertainment. Even children and toddlers can be seen using cellphones and tablets playing games or watching videos to pass the time. While it is true that the effects of technology is inevitable, we also should not forget that kids need to enjoy their playtime while they are still young. As much as possible, kids should not be exposed to gadgets and they should be encouraged to play outside with their siblings and other children. One way to encourage kids to stay away from gadgets is to provide them with the best backyard swing sets that they cannot ignore. If you have a great swing set or playset in your background, your kids will definitely spend most of their extra time there instead of just focusing their attention on gadgets. It will be beneficial for them because outdoor playing is a great form of exercise for kids and it can also develop their social skills when they are with other children. You may have heard or probably seen swing sets and playsets from advertisements or from people that you know. There are actually a lot of choices from different manufacturers so if you do not know what you are looking for, it can be quite challenging to choose the perfect one for your kids. To get you started, let us narrow down your choices and look at five of the best swing sets for kids that you can consider. Determine the amount that you are willing to spend because it will help you in narrowing down your options. The best may not necessarily be the most expensive so you do not have to worry about the amount. Only spend what you can but also make sure that the quality will not be compromised. There are playsets made of wood, metal, plastic, or a combination of different materials. Those made of metal are the strongest and the most durable but they can also be prone to rust and corrosion. Those made of wood are also durable but they have the tendency to crack or develop mildew if exposed to moisture. Those made of plastic may be the most affordable but they can also be brittle. The bottom line is, each material has its own advantages and disadvantages. You just need to decide and prioritize. Space is also an important consideration. You may have the budget but if you do not have the space, then buying a nice playset will be pointless. Check your available space and take note of it when shopping. If you have a small backyard, check out our guide of the swing sets for small yards. Given these things to be considered, let us now look at a more thorough review of the six playsets that we have listed down earlier. If you want a heavy duty kids outdoor play equipment for your playful and energetic kids to have a great time in your backyard, the Lifetime Monkey Bar Adventure Swing Set may be the one that you are looking for. This swing set includes three belt swings and a trapeze bar with gym rings to bring out your kids’ inner gymnasts. It is free standing so there is no need to dig up holes or use cement to put it in place. This amazing play structure also includes a fireman’s pole and an exciting 9’ wavy slide, not to mention the monkey bars which are always a hit for boys and girls of all ages. These features will definitely keep the kids occupied for hours, making them enjoy playtime and a little bit of exercise without them even knowing. What’s great about it is that this swing set is not just fun, it also ensures that kids will be safe as much as possible. For instance, the chains of the belt swings have rubber grips so that your kids’ little fingers will not get pinched or snagged. The swings are also safely secured to the frame of the whole structure with the use of chain clips. The manufacturer ensures that it passes the playground performance and safety standards. Parents can also be assured that the Lifetime Monkey Bar Adventure Swing Set is strong and durable enough yet still smooth and comfortable for their kids. It is made from a combination of powder-coated galvanized steel and high-density polyethylene which makes the structure resistant from extreme weather and rust. Because of the best quality materials, it is also not prone to cracking, chipping, or peeling. It is very easy to put together and assemble. It does not need any cement as it can stand on its own. It retains strength and maintains its color even after too much sun exposure and extreme weather. It does not require high maintenance. It does not need to be repainted because it will not stain, crack, warp, rot, or corrode. There are no hard edges so it is safe for smaller kids to run around. The edges are either rounded or covered with plastic caps. The whole structure is very sturdy and large that even adults can play with the kids. It is not recommended for children who are younger than 5 years old without any adult supervision. The bars are too high and the other features are too big. The Lifetime Monkey Bar Adventure Swing Set with 9 Foot Wavy Slide is best for families who have the budget and enough outside space where the kids can enjoy it and play comfortably. It may be pricey, but since it is strong and durable, you can definitely get your money’s worth and use the swing set for a long period of time. The Step2 Naturally Playful Playhouse Climber & Swing Extension can be considered as one of the nicest outdoor playsets for toddlers because it is recommended for toddlers who are three years old until eight. With this in your backyard, your kids will feel like they are in their own personal playground. It has a 5.5’ slide, two sturdy swings, a climbing ladder, and a dual-level playhouse with a swinging door. This playset is meant to be used by multiple kids even though they may not have the same interests because there are a lot of things that they can do. It is great for toddlers because they can explore and have an opportunity to develop their motor skills, balance and coordination, and social skills by playing with other kids. Since this playset also has crawl-through portals which also serve as a playhouse, your toddler’s imagination and creativity can also be enhanced whenever they play. As a safety precaution, the maximum weight that the climber can accommodate is only about 250 lbs or 113 kg while the maximum weight on each swing is only 75 lbs or 34 kg. The playset should also be assembled by an adult on a proper surface outdoors to ensure that everything will be in place. Compared to most playground sets, this is quite affordable at only about $500 to $600. It has a great design and the colors are natural so they do not look out of place in the backyard. Kids even younger than three years old can also play and enjoy in the playset. Durable and weatherproof so it is perfect for the outdoors. It is quite difficult to assemble as the manual was not very helpful with only pictures in it. It does not leave much room for bigger kids. If you are looking for swing sets for older child or children, this may not be the perfect choice because it is more suitable for toddlers in terms of space. Older children can still play but they may not be able to move a lot especially in the playhouse area. But for families who have toddlers and small, young children, the Step2 Naturally Playful Playhouse Climber & Swing Extension is a great choice. There are a lot of metal swing sets available in the market today and Lifetime Heavy Duty A-Frame Metal Swing Set may be one of the best. This freestanding playset includes two belt swings and a trapeze bar which the kids will definitely enjoy. It is recommended for kids ages three to 12 years but can still be used by those who are older but have small frames. This swing set can accommodate a total of 405 lbs or 184 kg. Since it caters to kids as young as three years old, safety is one of the manufacturer’s top priorities. 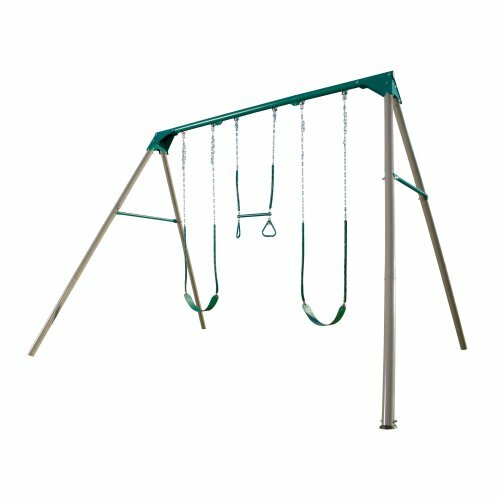 Like the Lifetime Adventure Swing Set, this metal swing set’s hard edges are also rounded or covered with plastic caps and the swing chains also have soft rubber grips to avoid pinching the little kids’ delicate fingers. Aside from being safe, this metal swing set is also durable as it is made from high strength low alloy steel which can survive any type of weather. Since it is made of metal, it will not crack or chip, fade or even peel like wooden playsets. There is no need to use anything else just to put it up, even cement. It is free standing so all you need is a flat open surface. You can also take it with you in case you move to another house. It does not require high maintenance. You do not have to repaint it every once in a while because it does not stain and does not fade. Safe for kids because there are no lead-based material. This swing set can definitely last many years and can be passed on to the newer members of the family. It rocks a little when both swings are used so it would be better to use an anchor on the ground. It can be a bit challenging to assemble because some of the bolts and screws do not fit. If you are just looking for an outdoor swing, you can settle for this metal swing set from Lifetime. It has great features and has two of the most important considerations for many people, especially parents: safety and durability. However, if you are looking for a playset which can provide a lot of activities and versatility, you might want to look at other options. Children can get easily bored and if you want them to really enjoy play time, get them something more than a swing set. It is understandable that parents would only want the best for their kids especially if their budget permits it. The best backyard playsets are usually the most expensive ones so if the cost is not an issue, you will have a lot of options and great products to choose from. One of the playsets that you might want to consider is the Lifetime Big Stuff Adventure Play Set because as the name implies, it has a lot of big stuff that your kids will surely like. This freestanding playset has a clubhouse with a hardtop roof so the kids will still be protected in case it suddenly rains when they are playing or when the sun shines too brightly. There is an activity chalkboard in the clubhouse for little kids to practice their writing or drawing skills. It can even be used by parents to write down some friendly and safety reminders or some words of wisdom perhaps. There are two swing sets with soft rubber grips on the chains to prevent pinching or snagging. This is a common feature among Lifetime swing sets that is why they have become a trusted brand among families. It also features a 3-D climbing wall which can be a good physical and healthy activity for the energetic kids. It also has a 9 foot long wavy slide which kids of all ages will definitely enjoy. You may think that it is already complete as it already has a clubhouse, a slide, a swing, and a climbing wall but there is more. This adventure play set also comes with a cargo net, just like those which are used in relays or military trainings but of course, in a much smaller and cuter version. There is also a trapeze bar, ships wheel, and binoculars in case the kids want to do some exploration. 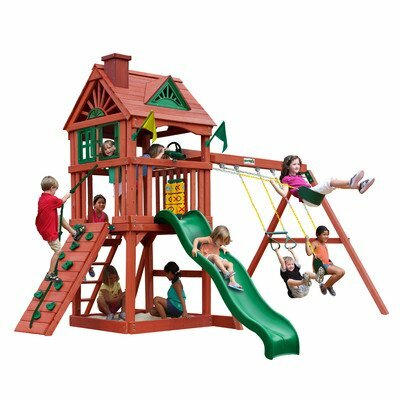 Same with the two other Lifetime playsets that we have reviewed earlier, this Big Stuff Adventure Playset is also made with high density polyethylene and powder coated steel which are both great materials in terms of quality and durability. Unlike the regular playsets which are made of wood, this is weather-resistant and will not warp, rot, crack, or splinter. Even the chains are rust-resistant and zinc-coated for additional protection. Any hard edges that can be found in this playset have been designed to be safe for children. The hard edges are either rounded or covered with plastic caps to avoid any fatal accidental bumps. The whole structure is safe and strong and passes the Playground Performance and Safety Standards. The materials used by Lifetime are guaranteed to be lead-free. It does not require any cement or anchoring to put this playset up. It is freestanding so it only needs to be assembled in a wide open space within your backyard. If the time comes that you need to move to a new place, you can just disassemble it and bring it along with you. Even though it is quite big, setting it up is pretty straightforward. You just have to be prepared to do a lot of work and you should take time to read the instructions very well. It is very sturdy and strong enough to be used by multiple kids. It can even be used by adults who are also kids at heart. Once it is assembled and used by the kids dozens of times, it does not need to be highly maintained. It only needs to be cleaned but not repainted or anything that needs a lot of work. Because of the materials used, this playset can definitely stand the test of times. The ladder can get a bit slippery when it gets wet so it would be better to put some gripping tape just to be safe. Compared to the other playsets and swing sets that we have reviewed, this is by far the most expensive. However, if you look at the difference, you can see a lot in terms of the features. It is like getting a complete package so that your kids will not get easily bored. The Lifetime Big Stuff Adventure Play Set is definitely one of the best outdoor playsets that you can get in the market today. For parents who are looking for the best wooden playsets for their kids, the Skyfort II All Cedar Wood Swing Playset by Backyard Discovery can be one of the top contenders. If you decide to buy it for your kids, it is like having their own wooden castle right in your backyard. This swing playset is made from 100% cedar wood but even though it is made of wood, Backyard Discovery’s wood material was tested to be rot resistant and highly resistant to natural decay as well. The durable cedar wood used in making this playset has been pre-stained to have a smooth and clear appearance. The plastic materials used in some parts are UV resistant while all metal components are applied with powder coating for maximum protection. To join major components together and ensure that everything is in its proper place, heavy duty steel brackets are used to ensure strength and hold. There are a lot of great features which make this playset stand out from the others in the market. It has a clubhouse which has a wooden roof, windows for ventilation, covered entry way, as well as bay windows. Like a tiny house, it also has a front porch with a sun balcony and a crow’s nest with telescope. If the kids want to have some snacks after several hours of playtime, they can stay at the lower deck and use the built in snack stand and the picnic table. The lower deck can fit four kids comfortably so no worries if your kids have some company. This playset also has enough play features and activities to keep the kids occupied for hours. It has monkey bars with three position swing beam which can help kids develop their strength and coordination. It is safe enough that the metal ladder and the climbing bars will not roll while being used. It also has a rock wall which the kids can use to get in and out of the upper fort area. There is also a ladder if they want to climb up the easy way. It is both fun and challenging especially for the little ones. Kids can also have a lot of fun using the 10 foot tall wave playground slide which is speedy but super safe. When the kids get a little tired from all the climbing and sliding, they can just relax and sit on the two belt swings or use the 2-person swing glider. Even though it is made of wood, it can hold up well to extreme types of weather, even a hailstorm. It might need a little maintenance but nothing which would cost a significant amount of money and effort. It has a variety of activities so the kids will not get easily bored. It is strong and durable. If cared for and maintained properly, it can last a long time. The color looks very natural and fits the outdoors. Building and assembly can be really overwhelming. There were too many pieces which made it even more difficult to assemble. It may be made of rot resistant wood but compared to metal and other synthetic materials, wood is more prone to damage caused by molds and mildew, cracks, and moisture. Probably one of the advantages of the Skyfort II All Cedar Wood Swing Playset by the Backyard Discovery among the other playsets we have reviewed are the number of play features that it can offer. It is the only one with an elevated fort and a separate snack area and picnic table where kids can unwind and relax. It also has the longest slide at 10 feet. However, it is also the biggest in terms of the space that it will eat up so make sure that you have enough space in your backyard before deciding to buy this one. There isn't much chance of kids getting bored with this busy play set. It's beautifully made with cedar wood in a great redwood finish and dark green accents. This set features two swings, a trapeze swing, a rock wall and climbing rope, a slide, and an upper-level clubhouse with fun details like a steering wheel, a telescope, and even tic-tac-toe. Underneath the clubhouse is a sandbox. This might be a good choice for kids who tend to get bored easily. Kids love the variety but I'm smitten with the design. There are adorable details like windows with working shutters, flags, dormers, and a chimney. If you have several children, this swing set might be a good choice for you since multiple children can use it at once. With a maximum weight capacity of 800 pounds, it's conceivable that 10+ kids could play at once. The best playsets and swing set reviews that we have tackled can help you decide in choosing the perfect one for your kids. There are a lot of things that you need to consider so make sure that you take note of everything before you finalize any purchase. One of the important factors is the budget. Do you have a specific budget in mind or are you willing to spend as much as it takes just to have the best for your kids? If budget is not an issue, the best recommendation in terms of strength, durability, and variety is the Lifetime Big Stuff Adventure Playset. Although the playset by Backyard Discovery has more play features, the downside is that it is made of wood. It has a higher tendency of being damaged compared to the Big Stuff Adventure which is made of polyethylene and powder-coated steel. However, if you are working on a budget, you can still get a great one for your kids when you buy the Step2 Naturally Playful Playhouse Climber and Swing Extension. It also has a variety of play features such as a slide, swings, a roomy deck, and a secret playhouse. You can get all these without spending more than a thousand bucks. Looking for the best swing sets can be difficult at first because of the large number of kids outdoor playsets that you can choose from. But it should not be too complicated for you because after all, you only want what is best for your kids without compromising your family’s finances. Do a lot of research, read product reviews, and do not hesitate to ask questions. Shop online and shop in stores if you have the time. That way, you can say that you have exhausted all your options before finally deciding on which playset is the right one for your kids.